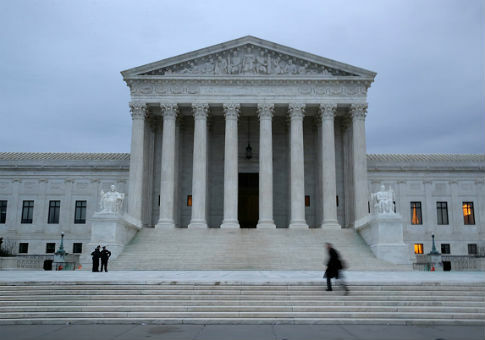 The Supreme Court on Thursday agreed to consider a case that could overturn a 40-year-old ruling that allows public sector unions to collect fees from workers who are not members. The nation's highest court is set to take on a case that has the potential to financially cripple Democratic-leaning labor unions that represent government workers, the Associated Press reported. Public sector unions are currently able to collect money from non-members in order to cover the costs of negotiating contracts for all employees. The court will now re-visit the 1977 Supreme Court case Abood v. Detroit Board of Education, which determined that public workers who refuse to join a union could still be required to pay fees for bargaining costs. The high court deadlocked 4-4 in a similar case last year, before Neil Gorsuch was confirmed as its newest justice, giving the court an additional conservative jurist. The 1977 arrangement was meant to prevent non-members from "free-riding" off of the union's legal duty to represent all workers. The latest challenge to this ruling comes from a state employee in Illinois, Mark Janus, who says Illinois law violates his First Amendment right to free speech by requiring him to pay fees subsidizing a union he does not support. Stakes are high as union membership in the U.S. declined to just 10.7 percent of the workforce last year, the AP noted. With the biggest hit in union membership affecting the private sector, half of all union members now work for federal, state, and local governments in states like Illinois, New York, and California, which are largely Democratic states seen as friendly toward unions. Janus is currently paying fees to the American Federation of State, County and Municipal Employees union, of which he is not a member. A federal appeals court in Chicago rejected Janus' claim in March, a month before Gorsuch was confirmed to the Supreme Court. Janus' appeal was filed in June. The case will be argued in the winter. This entry was posted in Issues and tagged Neil Gorsuch, Supreme Court, Unions. Bookmark the permalink.